This study was conducted to determine whether the pedaling frequency of cycling at a constant metabolic cost contributes to the pattern of fiber-type glycogen depletion. 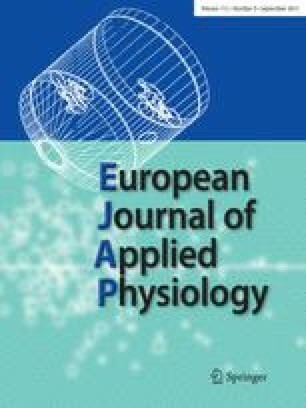 On 2 separate days, eight men cycled for 30 min at approximately 85% of individual aerobic capacity at pedaling frequencies of either 50 or 100 rev·min−1. Muscle biopsy samples (vastus lateralis) were taken immediately prior to and after exercise. Individual fibers were classified as type I (slow twitch), or type II (fast twitch), using a myosin adenosine triphosphatase stain, and their glycogen content immediately prior to and after exercise quantified via microphotometry of periodic acid-Schiff stain. The 30-min exercise bout resulted in a 46% decrease in the mean optical density (D) of type I fibers during the 50 rev·min−1 condition [0.52 (0.07) to 0.28 (0.04)D units; mean (SEM)] which was not different (P>0.05) from the 35% decrease during the 100 rev · min−1 condition [0.48 (0.04) to 0.31 (0.05)D units]. In contrast, the meanD in type II fibers decreased 49% during the 50 rev·min−1 condition [0.53 (0.06) to 0.27 (0.04) units]. This decrease was greater (P<0.05) than the 33% decrease observed in the 100 rev·min −1 condition [0.48 (0.04) to 0.32 (0.06) units). In conclusion, cycling at the same metabolic cost at 50 rather than 100 rev·min−1 results in greater type II fiber glycogen depletion. This is attributed to the increased muscle force required to meet the higher resistance per cycle at the lower pedal frequency. These data are consistent with the view that force development as opposed to velocity of contraction determines the degree of type II fiber recruitment when the metabolic cost of exercise is held constant.